En negritas lo que me llama la atención en mi traducción liberal. ¡Veremos si todo esto es cierto, pero tiene una pinta cojonuda! Dice graded hammer, ¿será distinto al del cp5? Sorry we haven't replied yet as we just got off a red eye from Japan. Here are some answers to questions that have been raised. We did ask to have some information held back on the forums, but only until we could get information out to our dealers so they wouldn't be caught by surprise. The ad appeared a few weeks before we thought it would. So we are happy to provide information here now that dealers have been provided with the information they needed. On September 9th at 1 PM PST Yamaha's website and dealer websites will be opened with complete information, movies and interviews with artists. The CP4 will start appearing in stores in the US around October 1st. The MAP price of the CP4 in the US is $2199.99. It does feature Spectral Component Modeling . It is a Graded Wooden Hammer action (the CP5 was balanced so the weight did not change over the keyboard). 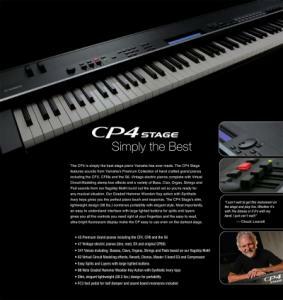 The CP4 Stage is the first pro stage piano to feature a CFX,Yamaha' flagship 9' Concert Grand. . It also has a CFIII and S6 pianos so the entire Yamaha Premium Piano Collection is represented. By the way, the S6 piano is very similar in design and part of the same family as the S700. It was specifically designed to have a warmer, more intimate sound than the CFX and CFIII. At the same time we are releasing the CP40 , a baby brother to the CP4 which has fewer sounds (no CFX and one tine EP model). This will be a MAP price of $1699.99 in the US and replaces the CP50. One of the biggest improvements on the new CP series is the user interface. It's very easy to understand and quick to get around on. We think people will really like it. There is also direct audio recording and playback to USB memory devices. If you have specific questions, we are happy to try and provide that information. 2200 $ en EEUU, ponen imágenes. ...y a mi que me pilla sin un duro!!! arggg! Y como añadido, por fin un piano estrecho y con los botones al lado de las teclas, así si se pone un 61 encima puedes juntarlos bien y no tienes que agacharte para alcanzar los controles del contrapesado de abajo! Creo que serán 2200 euros, he observado que lasmultis hacen equivalencia 1 dolar, 1 euro. Si fueran 1650 € sería un cañón de precio. A ahorrar tocan. Iskra, véndete algo que tienes muchas teclas. Iskra, véndete algo que tienes muchas teclas. Apuesto a que serán más bien 1600-1700€ precio de calle, si lo sacasen a 2200 con el CP5 a 2300, harían un pan con unas tortas. Y además, siendo más pequeño y menos "lujoso" en acabado que el CP5, es imposible que coincidan casi al mismo precio.